Welcome to our 2018 NFL Mock Draft! We have joined together with writers from a handful of other fantasy sports websites to preview the first round of the 2018 NFL Draft, from the viewpoint of how these picks will affect Fantasy Football owners. The mock draft is a slow draft, and we'll be updating all of the picks here. The Cleveland Browns have a long history of making the wrong pick in the NFL Draft. When they returned to the NFL in 1999, they drafted Tim Couch with the 1st overall pick. The Philadelphia Eagles drafted Donovan McNabb with the next pick. In 2000, again with the 1st pick in the draft, Cleveland selected Courtney Brown. His Penn State teammate, LaVar Arrington, went 2nd and Brian Urlacher was the 9th pick. With the 3rd pick in 2001, the Browns drafted Gerard Warren - the Cincinnati Bengals selected DE Justin Smith next and the San Diego Chargers picked LaDanian Tomlinson 5th. In more recent years, they "passed on" Carson Wentz and Deshaun Watson. The 2018 NFL Draft is setup in a such a way for the Browns that they almost can't mess this one up...right?! After acquiring Tyrod Taylor and Jarvis Landry in trades and signing Carlos Hyde to go along with Josh Gordon, Duke Johnson and David Njoku, the Browns have a legit offense heading into next season. 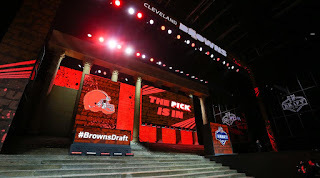 When considering which QB to draft - Sam Darnold, Josh Allen, Josh Rosen, Baker Mayfield - the Browns are looking at the 2019 season and beyond. As long as Tyrod Taylor stays healthy, the #1 pick in the 2018 NFL Draft should expect to hold a clipboard all year. In my opinion, their own draft history prevents them from taking Josh Allen. He might be 6'5 with a laser, rocket arm, but they cannot afford to take on such a huge project. From everything I have read this draft season, Darnold is much closer to being ready, despite the turnover issues and while his upside might not be as high, he is a much safer option to help continue moving this franchise in the right direction. Allen's inaccuracy should scare the Browns away from him with the 1st pick in the 2018 NFL Draft. Have mentioned that Sam Darnold really reminds me of Philip Rivers in certain ways. If you find yourself having trouble deciding which QB you think is right for the Browns, you are not alone. Looking at just the Mock Drafts that have been updated since Sunday over at Walter Football's Mock Draft Database, 32 mocks picked Josh Allen while 28 have them drafting Sam Darnold! Our Take: Tomlin thinks the Giants could trade down and that they like Webb more than the rest of us do. Problem is, new GM Dave Gettleman didn't draft him. If we were picking for the Giants here we would have to select a QB to ensure there is a future after Eli Manning. Our Take: No argument here. Despite bringing back Josh McCown and signing Teddy Bridgewater, the Jets need a franchise QB. Mayfield is arguable the most talented QB in the draft, but comes with some baggage. New York will either make him, or break him. Out Take: Click here to read our write-up on the Browns second pick of the 1st round. Our Take: Denver would be ecstatic if Rosen falls to them at pick 5. His durability is a question mark, but his talent is undeniable. With Case Keenum in town for two years this will give the Broncos time to get him healthy and develop him into their franchise QB. Our Take: Getting Andrew Luck healthy, keeping him on his feet and giving him time to throw the ball are key to the Colts success. Duh. Nelson is a monster and if he played left or right tackle would be the first pick in the draft. Our Take: Tampa will be fine on offense. Improving their secondary will go a long way in the NFC South. The Bucs had the worst pass defense in the NFL last season. Adding James at safety and the acquisition of Jason Pierre-Paul this Winter will help them improve. Our Take: One of our favorite prospects in this draft, Smith could give the Bears yet another Hall of Fame player at the linebacker position. Our Take: No matter where Smith/Edmunds are selected in the 1st round, the two of them will always be compared to each other. Both players are going to be great NFL LBs. Our Take: The Raiders would probably prefer one of those two LBs falls to them but Ward is a solid prospect and Oakland's biggest need come draft day is CB. Our Take: Miami needs so much on both sides of the ball, if I were them I would be looking to move this pick to a team that might want Josh Allen before the Bills draft him - I am looking at your Arizona! Our Take: This is a no brainer if he is still available for Buffalo. He shouldn't play until the end of the season/they get him some offensive weapons! Out Take: The Giants could add Barkley, Cowboys feature Ezekiel Elliot and the Eagles have a strong RBBC - the Redskins need to stop the run if they want to compete in the NFC East. Our Take: They turned last years first round pick into Deshone Kizer, let's hope they develop Jackson into a perennial Pro Bowl CB. Our Take: Lamar Jackson will have a better career than Josh Allen. Our Take: The Ravens are always looking for WR help. Playing Ridley next to Michael Crabtree actually sounds like a plan that could work and they just signed Willie Snead. Our Take: San Diego Los Angeles allowed 131 rushing yards per game on the ground, worst in the AFC. Payne will ease that...pain. Our Take: The Seahawks are at their best when they establish a ground game - but without an offensive line, it doesn't matter who is carry the ball. Our Take: The Cowboys group of WRs is lacking a big time play-maker with Dez Bryant gone. There is some nice WR talent in this draft and Dallas might have to "reach" for one before their guy gets drafted! Our Take: The Lions have bigger needs than a defensive lineman, but Chris believes new Head Coach Matt Patricia will look to solidify his defense line, just like those great Patriots teams. Our Take: Already added Cordy Glenn to the O-Line, now add Daniels at C and the Bengals could get that offense rolling again in 2018. Our Take: Bills need to just draft the best player available with every pick in the 2018 NFL Draft. Our Take: Nate Solder out, Mike McGlinchey in. Our Take: Every team needs to improve their offensive line, especially a team with a mobile QB in Mariota and a beast of a RB in Henry. Our Take: The more time Matt Ryan has to find Julio Jones, the better. Our Take: Fantasy football owners really want Drew Brees to have another elite TE. Our Take: Not a fan of teams ready to win now drafting pieces for the future in the 1st round but Big Ben is nearing the end of his career. They will need to draft defensive players with the next few picks. Our Take: Jacksonville proved last year that they don't need their top WRs to play their best football, but Blake Bortles needs all the help he can get with Allen Robinson now in a Bears uniform. Our Take: Well what do you know, the Patriots get another steal late in the 1st round of the NFL Draft. Knowing them though, they will trade out and acquire an extra pick or two.